One of the few times I have ever felt truly homesick in Japan was when visiting the Yoichi Distillery, the first home of Nikka Whisky. Situated about an hour's train ride from Sapporo in Hokkaido, Yoichi encompasses both the hoppy scents and the mountainous landscape of the Scottish Highland distilleries. This combination is not coincidental; upon searching Japan for a location to practice the arts he had studied in Scotland, Masataka Taketsuru claimed no other place had the right climate and clear waters needed for serious whisky production. Since in the first half of the 1900s Hokkaido was considered a barren wasteland, this crazy talk almost cost Taketsuru his financial backers. Whisky acquires its golden colour in the barrel. Initially, it is clear. Nevertheless, Taketsuru was persuasive and in 1934, the production of one of Japan's finest whiskies began. Yet Taketsuru's own story does not begin here, but rather 16 years earlier when he left Japan for Scotland. The third son of a sake brewer, Taketsuru's original ambition was to continue the family business. However, in sympathy with all those who have ever changed their major, Taketsuru's studies at (what is now) Osaka University, diverted him into the area of western drinks. This interest was shared by Settsu Shuzu, a liquor company who had plans to produce a Japanese whisky. To this end, they hired Taketsuru and --since the secrets of great Scotch were not something casually dispatched in a letter-- sent him to study at the University of Glasgow. While Taketsuru evidently learned much about whisky production in Scotland, the museum at Yoichi Distillery dwells less on this and more on his relationship with his future wife, Jessie (Rita) Roberta Cowen. Legend has it that love bloomed between the couple due to the great British tradition of burying chockable items in celebratory food. Taketsuru was sharing Christmas dinner with the Cowen family when he extracted a 6 pence from the Christmas pudding, traditionally foretelling a prosperous future to those who can avoid swallowing said item. Rita, meanwhile, found a silver thimble, declaring her a bride-to-be. Despite such omnipotence arising from their cooking, the Cowen family strongly opposed the match which caused Rita and Taketsuru to forfeit a church wedding in favour of a plainer registry signing. The newly wed couple then left Scotland to return to Japan. Unfortunately, the intervening two years since Taketsuru's departure had not treated the Japanese economy kindly and he returned to find his country in recession. The resulting financial hardships crushed Settsu Shuzu's ambitious plans for branching out into a new liquor, causing Taketsuru to leave their employment and join the Kotobukiya company which would later become Suntory, Japan's first malt whisky producer. Situated in the Osaka Prefecture in 1923, Kotobukiya built the Yamazaki Distillery to produce its malt whisky. Its owner, Shinjiro Torii, wished to produce a Scottish style of whisky that had a unique Japanese flavour. This didn't sit well with Taketsuru, who wanted to remain faithful to the Scottish techniques. Despite the success of the Yamazaki Distillery, the rift between Torii and Taketsuru caused Taketsuru to leave and begin his own whisky production in Yoichi. During this time, Rita had taken up Japan's most popular job for foreigners in teaching English. It was her contacts through this work that made it possible for Taketsuru to gain the financial support needed to begin his own distillery. Even allowing for the importance of this act, Rita's prominence in the Yoichi Distillery museum and exhibits is surprising. Several information boards in the museum are devoted to her life and their married home (also on the same site) contains many pictures of her both with and without her husband. Perhaps this interest stems from the fact that while foreigners living in Japan are something of a novelty today, the appearance of a Scottish woman in Hokkaido in the first half of the 20th century is nothing short of astonishing. That said, Rita's presence in Japan was not always warmly received. When war broke out, Rita became a target of suspicion and dislike, both from her neighbours and Japan's security departments. While her marriage and subsequent nationalisation allowed to remain in Japan, Rita was nevertheless frequently shadowed by Japan's special police even on such mundane errands as delivering her husband's lunch. Despite this difficult period, Rita appears to have thrived in Hokkaido with photos showing her tumbling through the snow on skis, relaxing with her husband and meeting friends. There is little doubt that Rita was a woman of quite some spirit. The success of any whisky is of course not in its history but in its tasting. Nestled among the buildings devoted to the various stages of whisky production on the Yoichi site, are several spots where the famous drink can be sampled. The most frequented of these would doubtless be the free taster bar, situated above the restaurant. This large sunny room offers a view over the surrounding landscape while providing visitors with a choice of whiskies, apple wine and juice. However, to really sample Nikka's finest, it is worth stopping at the museum bar. It is here that shots can be purchased of the more specialised blends and malts. Nikka whisky has a strong peaty scent and a flavour that resembles the Islay malts of Scotland such as Lagavulin or Laphroaig. For those who appreciate the smokey taste, the first stop at this bar should be the 'Peaty and Salty' single malt. There are also the rarer 'single cask' malts available which consist not only of a single year, but are also drawn from a single barrel. Since every barrel lends a slightly different flavour to the drink, each single cask malt has its own unique flavour. 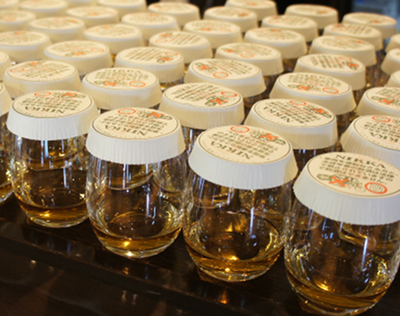 As such, single cask malts are not easily found outside the distillery, since a more uniform taste is required for the Nikka label. Bottles of these whiskies are also available to purchase, with the distillery seeming to take a particular delight in packaging their most prized products in the plainest of bottles. Perhaps this is protection for the buyer who will not feel forced to share such an unassuming container with guests or maybe Nikka simply feels such drinks speak for their own quality. Designated drivers are not forgotten at Yoichi. Juice and water is available at the taster bar and drivers are requested to adorn themselves with one of the 'designated driver' yellow stickers. This act is slightly amusing, not because drinking and driving should not be taken seriously, but because if a person is old enough to do the latter, a sticker probably isn't going to prevent him/her making an irresponsible decision. For visitors thinking of Yoichi, it is worth considering the summer is a slightly better time to go. More of the buildings involved in the whisky production are open during the warmer months, although the museum, bar, restaurant and several other locations are open year round. The museum contains information both in Japanese and English and the restaurant serves good food which is reasonably priced. I was about half-way through my large plate of rice and sea urchin when I did pause to note that in the food at least, Yoichi was not Scotland.